See local artist Margaret Neher at work in the Amphitheater Hot Shop on March 9 from 10 am to noon, and 1 to 4 pm. Neher is from Ithaca, N.Y., and this demonstration is part of Local Artists Week. Margaret Neher began working with stained and etched glass in 1984, and spent several years making kaleidoscopes. 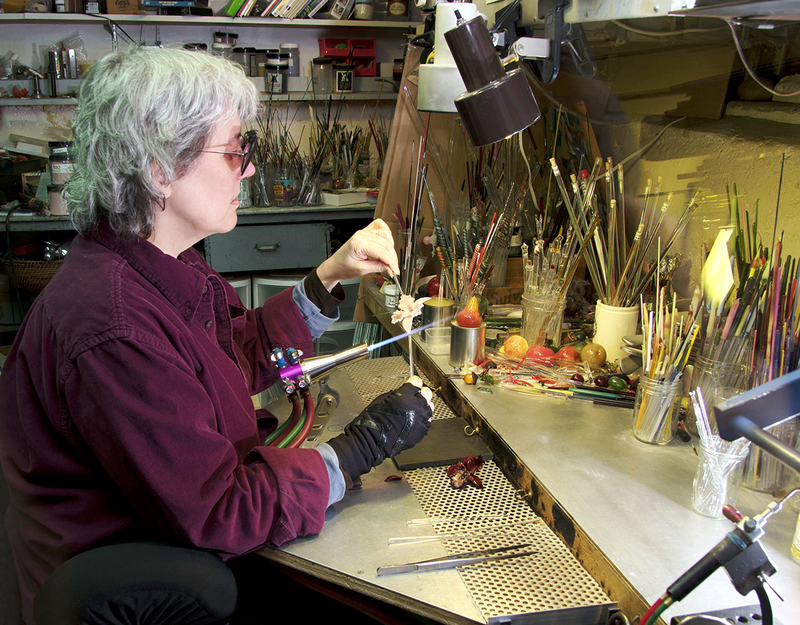 A three-time NICHE award winner, she has been flameworking since 1991. Her work is sold in shops and galleries throughout the U.S. Fascinated by nature’s endless variety of shapes and color, yet frustrated by their ephemeral nature, Margaret Neher turned to glass. “I’m drawn to the challenge of working to capture a complex, ever-changing living thing in an unchanging form.” Neher uses flameworking to translate the fragile delicacy, vibrant colors, and unique details of nature—both flora and fauna—into lasting art objects.